This is how you celebrate the 30th anniversary of an automotive icon. This year’s Geneva Motor Show has been full of surprises. While we already knew that renowned Porsche tuner RUF was going to reveal a new supercar, we didn’t expect it to be a brand new CTR, designed in tribute to the original iconic 1987 Yellowbird to celebrate its 30th anniversary. Capable of reaching 213 mph, the extensively modified Porsche was regarded as the fastest car in the world at the time, and was tuned to produce 469 horsepower. This new RUF CTR, on the other hand, develops nearly twice that. There’s another twist, too – unlike the original, it isn’t based on a Porsche 911. Instead, the new RUF CTR will be the first car to be built on the company’s own in-house-developed chassis, a platform which also happens to be the first carbon fiber monocoque chassis developed for a rear engine car. It still retains the same 3.6-liter, twin-turbo flat-six engine based on the 911, though, except this time it’s been tuned to produce a whopping 700 horsepower. That should be interesting to handle with rear-wheel drive. 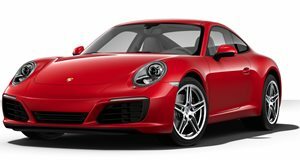 The new CTR adopts the rear-engine setup of the 911, which sends power to the rear wheels through a six-speed manual gear box. 0-60 mph can be achieved in under 3.5 seconds, and 0-124 mph takes less than nine seconds before the CTR reaches a top speed in excess of 225 mph. The CTR’s carbon fiber bodywork also makes it extremely light – it weighs just 1,200 kg (2,640 pounds), resulting in a power to weight ratio of 3.5 lbs per horsepower. Elsewhere, the front and rear axle have double-wishbone layouts with a pushrod configuration which should make it a hoot to handle. Inside, the seats are coated with alcantara upholstery to save extra weight along with the carbon fiber trim, as well as adding to the retro-inspired design. “The concept for the 2017 CTR is one that I have had in my head for a very long time,” said Alois Ruf, President and owner of RUF Automobile GmbH. “We have been waiting for the right point in our history to build our own car and the 30th anniversary of the CTR ‘Yellow Bird’ is that moment.” It’s taken five years for RUF to create the new CTR, but we can’t think of a more fitting tribute to the iconic Yellowbird. Pricing hasn’t been announced, but only 30 are being produced to mark the anniversary when the CTR enters production next year. An additional prototype model was also presented at Geneva, which you can see in our photos from the show below.